Check the photo; you would think we were in Antarctica. We got up in thick fog and we could not leave until 8:30. 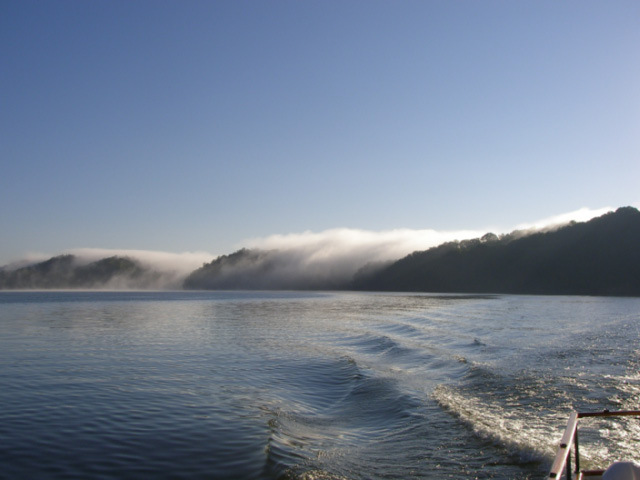 Looking back the fog was still thick in places on the shoreline of Watts Bar Lake. It was a beautiful sight with the sun coming up behind the fog. We were through the Watts Bar Lock with only a slight delay. The current below the dam was running at 0.8 to 1.0 mph the entire way to Shady Grove so we made good time travelling 63 miles by 3:30PM. There are two other "loopers" here now so we will have a reunion at the cocktail hour.